in medias res, in the middle of things, is trotted out in writing classes as THE place to begin telling a story. I was taught it. I have taught it. I read it in the “successful” books now being published. So when I sat to begin reading with my son this past week, and he interrupted me after a few pages to say, “I hate it when a book starts in the middle of the story,” (uh, did I mention this was my first published book we were reading?) it was a bit of a shock. “What do you mean?” I asked. Idiot. Exactly what we don’t have. And if I do that–if I ‘take time’–I don’t have a hope of finding an editor, a publisher, let alone those marketing people, to publish my book. But how to explain that to an angry-looking red-head who is asking for setting. This son, my third, is not a happy reader. 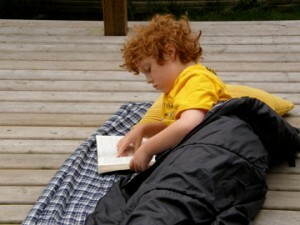 He only began to enjoy reading after about six months of home-learning in grade 5. Before that, it was a chore; a school-task. And now there are many books he sets aside, often returning to a small number of default. A month ago he explained to me that when he reads Harry Potter to himself, he can “see” the story. Other writers don’t quite manage to do that in the same way, though if I read aloud to him…after awhile…then he can also “see” the story.